Ord is central to four lakes and four rivers. That makes for excellent water fun year-round. World-class fishing can be found at the Calamus, Davis Creek and Sherman Reservoirs, all within 25 miles of Ord. If you’re partial to canoeing, our area rivers have some of the best hidden waters trails in the United States. The North Loup, Middle Loup, Calamus and Cedar Rivers are all within 20 miles of Ord. In addition to canoeing, tubing and tanking are great, slow ways to take in the scenery. 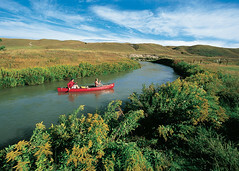 Check out Nebraska Game and Parks’ water trails guide for to learn more about the area rivers. The Calamus Reservoir is located 22 miles northwest of Ord and features more than 5,000 acres of water surrounded by beautiful white sand beaches. 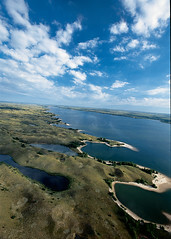 The Calamus is the second longest lake in Nebraska, with fishing, boating and water sports, wind-surfing and canoeing. 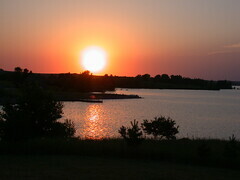 The Calamus State Recreation Area has two modern and two primitive campgrounds. Contact the local park office at (308) 346-5666. The Calamus State Fish Hatchery is one of five hatcheries in Nebraska’s fish production system and located directly below the Virginia Smith Dam. The Hatchery is a great half-day excursion if you’re boating or fishing at Calamus Reservoir. Located 18 miles south of Ord, Davis Creek is a hidden gem in Central Nebraska. Just five miles off of Nebraska Hwy 11 through North Loup, Davis Creek is open 24 hours and is a great fishing lake. Fish species include walleye, crappie, yellow perch, channel catfish, and bullhead, with an abundance of prairie wildlife round in the surrounding state wildlife management area. You can learn more about Davis Creek here. Located 25 miles south of Ord, Sherman Reservoir is a large fishing and water sports lake surrounded by the Sherman Reservoir State Wildlife Management Area and offers fantastic hunting as well. Park offices can be contacted at (308) 754-0230. This newly renovated lake on the Cedar River is located 25 miles northeast of Ord on Highway 70 and offers fishing, tanking and fantastic canoeing opportunities. The North Loup River is a spring-fed, sand-bottomed river that runs through a basin that covers nearly one-fifth of Nebraska. The North Loup flows directly east of Ord and can be accessed at Anderson Island. The North Loup is a fantastic (and hidden) water trail for both canoeing and kayaking. The Calamus River is a slow, meandering river right in the heart of the Sandhills. That means spring-fed, cool waters great for trout fishing as it gently approaches the Calamus Reservoir through Hannaman Bayou. The Cedar River flows 20 miles east of Ord and is spring fed from the Ogallala aquifer. The river flows cool in mid-summer, offering a respite for tankers, tubers and canoers.